OAKLAND, Calif. -- Kevin Durant drove through the lane untouched for dazzling dunks. He dished off even when he could have slammed it home, and did it all on defense. Oh, he hit from long range, too. What a dominant NBA Finals opener with the Warriors. Durant finished with 38 points, eight rebounds and eight assists to lead Golden State past LeBron James and the defending champion Cleveland Cavaliers, 113-91 on Thursday night in Game 1. "We could be a lot better than we were tonight but in the Finals you get a 'W,' we'll take it," Durant said. James wound up with 28 points, 15 rebounds and eight assists a day after dealing with bigotry far away from basketball. Someone painted a racial slur - the N-word - on the gate of his Los Angeles home, leaving James to address racism rather than his seventh straight Finals appearance or stopping KD. James said he would do his best to be ready for the series opener when his mind was elsewhere, concerned for his wife and children back in Ohio. "They're the best I've ever seen," Cavs coach Tyronn Lue said. "They're 13-0, they're constantly breaking records every year." Durant won the first battle with King James. "Those are two big household names, so we know you guys and the fans are going to want to see that and pick up on it," said acting Warriors coach Mike Brown, facing a Cleveland franchise that fired him not once but twice. "I'm sure LeBron probably thinks he could play better, and you tip your hat off to KD." Kyrie Irving, who hit the deciding 3-pointer with Curry's hand in his face last June as Cleveland rallied from a 3-1 series deficit to win the city's first major team title in 52 years, scored 24 points on 10-of-22 shooting. Kevin Love grabbed 21 rebounds and scored 15 points, while Tristan Thompson was held scoreless and to four boards. Durant's only other Finals ended at the hands of LeBron and Miami in 2012. He shot 14 for 26 in his fifth 30-point performance this postseason, receiving a rousing ovation when he sat down for good with 2:16 remaining. The shooting was far from pretty, and Cleveland's defense was a step behind most of the night, unable to stop the star-studded roster of All-Stars and key role players on the other side. Golden State finally warmed up after nine days off, while the Cavs had a six-day break since beating Boston in the Eastern Conference finals. Golden State's four turnovers tied an NBA Finals low. Cavaliers: James' 3-pointer in the third quarter moved him past Reggie Miller (320) for second place on the NBA postseason list, which is led by Ray Allen with 385. ... Cleveland committed 12 of its 20 turnovers in the first half - "20 in the Finals is not going to get it done," Irving said. Warriors: Coach Steve Kerr had hoped to feel well enough to return to the bench but stayed behind the scenes in the locker room as he continues to deal with complications from back surgery nearly two years ago. "My heart goes out to him," NBA Commissioner Adam Silver said. 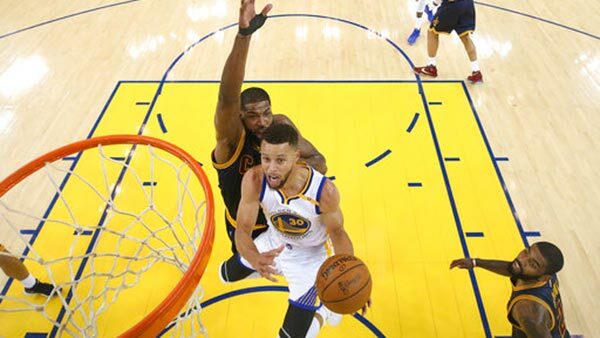 ... Curry became the fifth player in NBA history with 300 career playoff 3s after coming in with 295. ... Klay Thompson, playing more stellar defense while missing all five of his 3-point tries and scoring just six points, notched his 77th career postseason game to tie Jeff Mullins for most in franchise history.